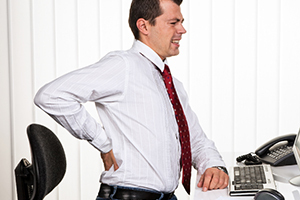 Low back pain is the single leading cause of disability throughout the world, and about 31 million Americans experience it at any given point in time. There are many different conditions that may lead to the development of low back pain, and one of the most common is called degenerative disc disease. This type of disorder occurs when intervertebral discs that rest between each bone (vertebra) of the spine experience changes that causes them to break down, which results in symptoms like low back and neck pain. Although non-surgical treatments like physical therapy is typically recommended at first for degenerative disc disease, a surgical procedure called lumbar total disc replacement (LTDR) may be recommended if the condition doesn't improve or worsens. The goal of LTDR is to relieve pain and restore the motion of the spine, and the number of these surgeries performed has increased in recent times. Following surgery, physical therapy is often prescribed to help patients recover properly, but there is a general lack of research that investigates the effects of this type of treatment. For this reason, a study was conducted to evaluate the long-term effectiveness of physical therapy following an LTDR surgery in order to better guide medical professionals. Patients who underwent LTDR for degenerative disc disease or a similar condition were recruited, and a total of 600 fit the necessary criteria for the study. Following surgery, all patients were given the option of either rehabilitating on their own or receiving physical therapy. This led to 202 patients who rehabilitated on their own (group 1), 123 who received 1-3 sessions of physical therapy (group 2) and 275 who received four or more sessions of physical therapy. Physical therapy began four weeks after surgery and consisted of education on surgery and the recovery process, treatments administered by the therapist, and various exercises. The exercises focused on improving the way patients walked and aligning their posture, as well as stretching the legs and lower back. All patients were assessed for low back pain, disability, and quality of life at three, six, 12 and 24 months after surgery using a number of different tools. Results showed that patients who received four or more sessions of physical therapy following LTDR surgery (group 3) experienced the most significant improvements of all groups. In particular, these participants showed less functional disability, reduced pain and better quality of life than the other two groups. These improvements were noticed as early as three months and were maintained up until the final patient assessment at 24 months. Based on these findings, it appears that a physical therapy rehabilitation program consisting of at least four sessions is effective for reducing pain and disability and improving the quality of life for patients following LTDR. Though additional research is needed to confirm these findings, patients who are scheduled to have this type of back surgery should be sure to opt for physical therapy afterward in order to experience the best possible outcomes.